The Littlehampton Academy (TLA) is a secondary school in Littlehampton, West Sussex. The school steelband was formed in November 2005 by the Head of Music, Mr Nelson. The aim for setting up the steelband was to give performance opportunities to young people in Littlehampton. The steelband is called TLA steelband. Each steelband practices once a week and is taught by Mr Nelson. The steelbands perform locally, throughout the United Kingdom and abroad. Some of their recent engagements have been Disney Paris 2009, Music for Youth National Festival 2010 and the Tyneside Steelband Festival 2010. Locally the steelbands raise money for a children’s charity - The Chestnut Tree. In 2015, TLA Steelband will celebrate its tenth anniversary. As a mark of this achievement Mr Nelson formed Sussex Steel Community Steelband to make steelpans more accessible to the people of Sussex and beyond. 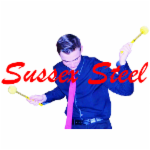 The core members of Sussex Steel are members from TLA Steelband who have since left The Littlehampton Academy. Sussex Steel has got off to a great start by securing regular bookings at Brighton Fringe, Brighton train station, Worthing Town Centre and Worthing Lido.